The following article by Sam Black was published in the June 30, 2014 afternoon edition of the Minneapolis/St. Paul Business Journal. 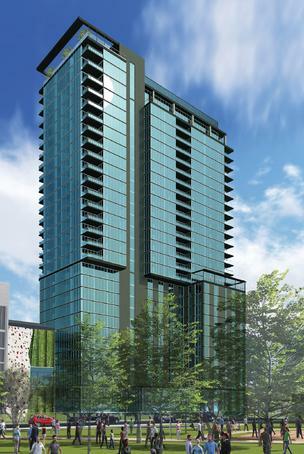 A conceptual rendering of the Radisson Red hotel and apartment tower Ryan Cos. US Inc. planned near the Vikings stadium. Carlson Rezidor Hotel Group disclosed Monday that the Radisson Red is no longer part of the plan. A Radisson Red hotel is no longer part of Ryan Cos. US Inc.’s proposal for a tower next to the new $1 billion Minnesota Vikings stadium. Ryan’s initial $101 million proposal, approved by the Minneapolis City Council in March, described a 27-story tower anchored on the first 10 floors by a 150-room hotel, a new brand to be developed with Minnetonka-based Carlson Rezidor Hotel Group. “The Radisson Red proposal is no longer active, however Carlson is continuing to explore other opportunities with [Ryan] on downtown projects that make financial sense for [the Radisson Red] brand,” Carlson Rezidor Hotel Group spokesman Ben Gardeen said in an email. The top 17 floors of residential units are slated to be developed by Chicago-based Magellan Development. The project was going to occupy the “air rights” above a new, $49 million parking ramp at 728 S. Fourth St. that Ryan is building for the Minnesota Sports Facilities Authority (MSFA). The 1,600-stall ramp is being funded as part of the new Minnesota Vikings stadium next door. Ryan agreed to pay the city $5.65 million for the development rights. Ryan expected approval of its final development plan and to close on the air rights purchase this summer. The City Council picked Ryan’s development plan over one proposed by Golden Valley-based Mortenson Development. The city would probably have to give approval if Ryan decides to pursue the project without the hotel. The city could turn to Mortenson to negotiate a deal or put the project back out for another round of proposals. Mortenson pitched a $63 million, 300-room hotel that would be co-branded as AC Hotels and SpringHill Suites, both Marriott International Inc. brands. Mortenson offered $3 million for the development rights. Frey declined to discuss any of the issues that might have led to the Radisson Red decision, saying it’s more important to concentrate on the future. This entry was posted in Downtown East Park on July 3, 2014 by citoyen1789.